I came up with these to go with Steve's birthday Punkin' Slab Pie. When grandma told me that he wanted a pumpkin pie I couldn't believe my ears. Is this the same guy we helped crack pecans so he would make us a wonderful fresh pecan pie? Ok, then grandma. I'll make him that pumpkin pie but we must top it with pecans. I was going to make spiced pecans, but decided that I didn't want to take away from the spice combo in the pie. Pecans, salt and honey sounded perfect. I guess it tasted perfect too. At least a couple of people said so. Stir together the pecans, oil and salt. Spread on a rimmed baking sheet. Bake for 7 minutes. Bring the honey to a boil over medium heat in a medium saucepan. Add the baked pecans to the boiling honey and stir to coat for a minute or two. Let cool slightly, then spread on a piece of parchment paper (or wax paper) to cool and dry. Make sure to do this while they are still warm otherwise they will stick together. Allow to cool completely. Hey everyone! I have decided it about time I up my email game. If you are getting daily emails and like them, great! No reason to change anything. If you would prefer an occasional digest instead, feel free to sign up below. Hopefully this will give you a new and interesting way to keep up with what we have been up to! Feel free to let me know what you think as we go. I am learning and always open to suggestions! These sound delicious and look really easy to make. My mother has pecan trees and keeps me supplied with pecans. I will have to try these with one of the bags I have in the freezer. Bet the hubby would love them. Thanks for sharing! Pinning! I am envious of your supply of fresh pecans! This would be a great use for some! 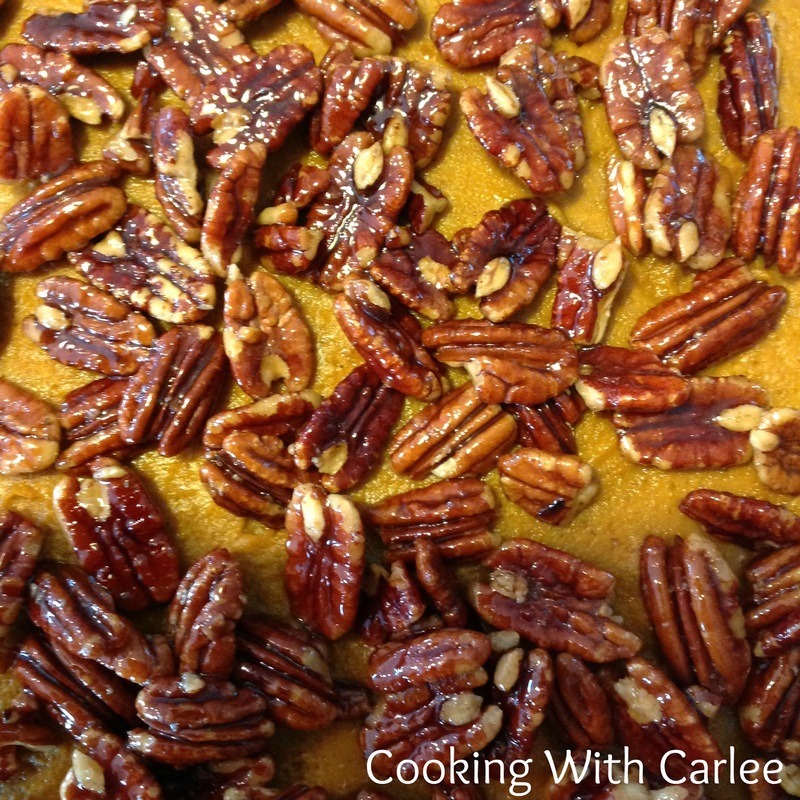 They are great on their own and even better on the pumpkin slab pie! Mmmm! Thanks for hosting! Pinned yet again! cant wait to try the pie recipe! Thank you so much! They all go so wonderfully together! Honeyed Pecans, what a great treat! Thanks so much for sharing with Full Plate Thursday and hope you have a great week. They were delicious! Thanks for hosting!